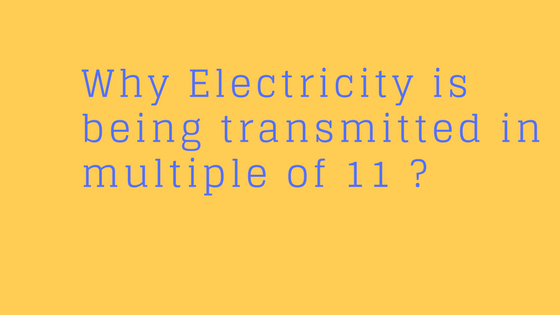 Why electricity is being transmitted in multiple of 11 ? There is no real standard around the world and many countries use different voltage levels for their purpose. [So that the answer is quite simple in that when one designs motor and transformer and even instrumentation, one finds that such equipment respond to the average value of voltage, current and flux. As such transformers are normally designed to have an integer value for voltage/turn OR Ampere-turn. also alternators also available which can generate voltage level in the range of 10.5kv to 15.5kv so generation in multiple of 11 does not arise. why do we use ac and not dc system in India ?